Federal officials have come up with promising, new plans for improving Head Start — including longer program days and years — but this growth can only happen if Congress provides the necessary funding. Back in 2007, Congress asked the Office of Head Start to update its performance standards. The result is a newly released proposal, the “Head Start Performance Standards,” from the Administration for Children and Families, part of the U.S. Department of Health and Human Services (HHS). The revised standards would “improve the quality of Head Start services so that programs have a stronger impact on children’s learning and development,” the HHS proposal says. Under the new regulations, Head Start would also cut red tape by streamlining and reorganizing “the regulatory structure to improve regulatory clarity and transparency…” And it would be easier for current and potential grantees to work with the program. 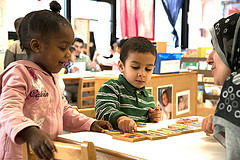 “A high-quality Head Start program can change the course of a child’s life, and engage the potential of the entire family,” Linda K. Smith wrote in a recent blog. Smith is HHS’s Deputy Assistant Secretary and Inter-Departmental Liaison for Early Childhood Development. One daunting caveat about these proposals is that more time in Head Start will cost more money. Increasing “the length of a Head Start operation’s day and the number of days it must operate per year—would come with a hefty $1 billion price tag,” Education Week reports. “President Barack Obama’s fiscal 2016 budget proposal would increase Head Start’s funding to cover both the school day and year changes and to pay for other Head Start initiatives. But, the spending increase is far from guaranteed. Advocates can take action by asking members of Congress to invest more in Head Start and by responding to the proposed revisions. what about the salaries for teachers??? If You want full year programs and more quality educación. Because their paying 12.50 per hour and a A.A.